We had a difficult time working blue and brown nursery ideas into a wild animal or jungle safari theme. My husband insisted on blue and brown as a color scheme while I tried to sell him on a jungle theme. Baby animals are just so cute and I wanted them so badly for our baby boy, Owen's room. 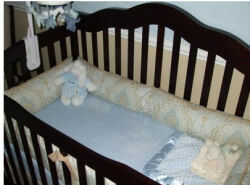 crib sets with safari animals that will work with a brown and blue nursery color scheme. After a lot of discussion made it clear that neither of us was willing to give in completely; we decided to compromise. And I am so happy we did since as you can see from the nursery pictures, the results are adorable! The beautiful blue and brown baby bedding set was handmade with love by Owen's Mimi as were the wild animal print window treatments (LOVE the combination of leopard print and brown check fabric, don't you? ), the leopard print diaper stacker, and the giraffe print lampshade. Mimi is a quilter who took a break from piecing quilts to design a one of a kind, custom room for her grandson. That little bit of information makes sense of the unique blend of blue and brown nursery ideas. Quilters are masters at combining the prints and patterns of many fat quarters to create lovely examples of practical art. Thanks to proud mom, Marina, at Penny Lane Designs for sharing her stylish blue and brown safari nursery ideas with visitors of Unique Baby Gear Ideas. Join in and write your own page! It's easy to do. How? 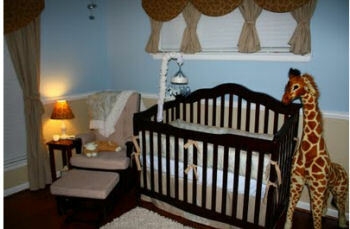 Simply click here to return to BLUE and BROWN NURSERY PICTURES and IDEAS.